Mitsubishi Electric has launched a FA-IT open platform for factory automation based on edge computing. The platform facilitates connectivity between factory shop floors and value chains via Internet of things (IoT) systems, says the company. 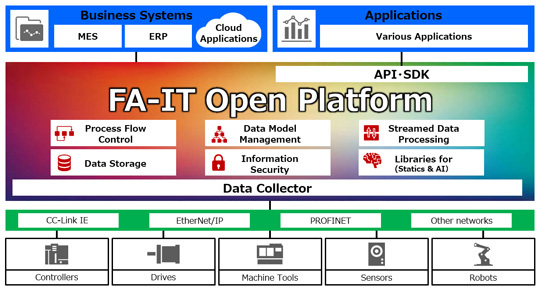 Vendors can download the free development environment to create manufacturing applications for operation on the platform, including connecting the platform to industrial networks for the collection of data from diverse devices and production equipment. Users can also design, manage and access equipment data models without being programming experts. The cloud-connected platform can be used to link manufacturing sites with IT vendors’ own cloud-supported manufacturing-optimization services for supply chains, administration of multiple factories worldwide and other applications. The platform will be integrated with solutions based on Mitsubishi Electric’s ecosystem for factory automation. The company says it is also considering opening an online application store.